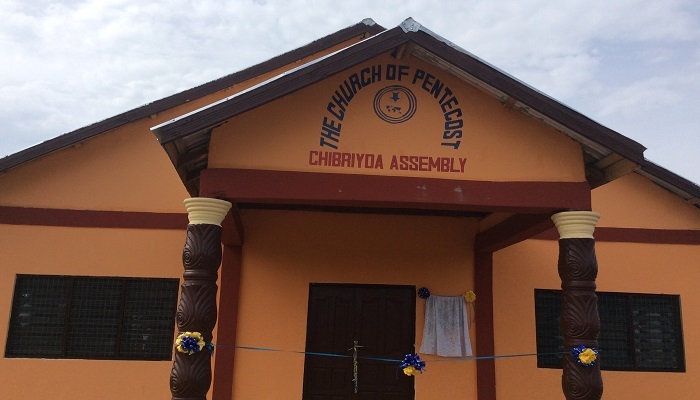 The Chibrinyoa Assembly church building of Bamboi District in the Kintampo Area of The Church of Pentecost has been dedicated to the glory of God. The ceremony, which took place on Friday, April 5, 2019, at Chibrinyoa, was officiated by the Area Head, Apostle Gideon Obeng Darko Debrah, assisted by Overseer Samuel Adae, the District Minister. Overseer Bosomah explained that Jesus Christ aims to build an untouchable or unmovable institution called the church in the world. Therefore, He asked His disciples to wait for the outpouring of the Holy Spirit in Jerusalem. Consequently, the disciples were empowered when the Holy Spirit had come upon them. He further noted that the Church represent believers and could be classified either as the invisible Church or the Local Church. Overseer Bosomah also stated five reasons why Christ is building the Church. According to him, the first reason is that the Church is an ambassadorial seat on earth and has therefore been invested with power and authority. He also said that the Church is meant to be a voice for the voiceless. Therefore, the church must always speak the truth and be trustworthy in her dealings. In addition to the above, the Church is also being built to be a transformational agent in society and also give life through the Spirit. Finally, he noted, that the Church is built because it is the only hope for the world today. Overseer Bosomah, therefore, encouraged Christians to desire for the infilling of the Holy Spirit because, without the empowerment of the Spirit of God, they cannot do anything. The Anyima District Minister said that it is imperative for Christians to seek the infilling of the Holy Spirit because it empowers believers to preach the gospel boldly, the Holy Spirit brings revival in individual believers and the Church and the Holy Spirit also brings anointing for service. Overseer Emmanuel Bosoman also added that the Holy Spirit makes the believer untouchable and unstoppable and also direct the ways of the believer to lead a life of righteousness. Apostle Gideon Obeng Darko Debrah, therefore, encouraged the Christians to always yearn for the infilling of the Holy Spirit.